Believe it or not, Obama’s very tough for business. The contradictory characterizations of him as fascist or socialist only serve to confirm the truth — he’s a raging moderate. And satirists don’t do well with moderates, especially thoughtful ones. In addition, Obama rarely makes gaffes and has no salient physical or temperamental features. And sinking popularity isn’t a critique. Even SNL’s main rap on him is his unflappability, hardly a vice in a world leader. Hmmm … First of all, you could make a pretty good case that Obama isn’t terribly moderate — at least not in a center-right nation like the U.S. I suspect that’s why his party will take such a drubbing in the midterm congressional elections. He “rarely makes gaffes?” Perhaps that’s because they’re seldom reported in the news media Trudeau consumes. Indeed, Obama’s list of gaffes is long and substantial — not quite on a level with his vice president, but formidable nonetheless. No “salient physical” features? Are you kidding me? Cartoonist Pat Oliphant has said the same thing, complaining that “Obama’s physical features don’t naturally lend themselves to caricature.” Think about it, guys. The big ears, the white teeth, the cigarettes, the omnipresent TOTUS. Heck, George Bush was mercilessly caricatured to look like Curious George, a baboon, Alfred E. Newman or worse. As I’ve already stated, I can’t pretend to get inside of Trudeau’s head. But I suspect his reluctance to caricature Obama stems from a genuine affection for the man and his policies, coupled with a fear of being labeled a racist for exaggerating Obama’s physical features. Come on, Gary. Throw political correctness to the wind, After an initial reluctance, even Jon Stewart has dared to make fun of the man he once supported. 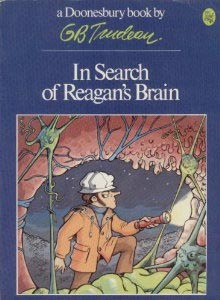 You once went In Search of Reagan’s Brain. Can’t you go looking for Obama’s ‘prompter? 7 Responses to Come On, Gary! You have nailed this one to THE WALL!I think so many people have JUMPED ON THE BAND WAGON of 'making history with the first black President' that they have forgotten issues –the economy, REAL health care, on and on …While I RESPECT Obama, I absolutely oppose his agenda … that does NOT make me a racist or bigot … I am simply a citizen who thinks he is taking this country down a dumpy, pothole infested road that will send us off the cliff if we don't gain the sense to turn around in time.The idea that THIS PRESIDENT is somehow insulated from SATIRE, which all of the others have 'enjoyed', proves the point that we are a society full of people who have problems with 'diversity' … in essence, a society that DENIES that we still suffer from racial and ethnic divides.We are all equal … we can all be PRAISED AND CRITICIZED without any prejudice, either way.While I strongly disagree with Obama and his policies, I believe he deserves the same treatment that Presidents in this modern age have received. They have been praised, satirized, scolded, whatever.To treat him any differently than his predecessors is showing nothing short of prejudice!Isn't that what was SUPPOSE TO END with his election? After reading Hot Air's "Obamateurism of the Week" for two years, I think Obama can be funny enough on his own. Especially when speaking "Austrian". This is my favorite Obama gaffe.http://dailycaller.com/2010/02/28/obama-demonizes-acme-insurance-for-not-covering-liability-insured-car-video/When he was much younger, Obama bought minimum liability insurance for his old beat-up car. He then complained that when he was rear-ended, the company would not pay to repair the damage.Is Obama really that stupid or did he make the story up without thinking it through? I suspect the latter. TerryYou say you can't get inside Trudeau's head, but it seems like you got into his book, newspaper and magazine collection. And hacked into what news he watches on the internet. You say Trudeau doesn't read about POTUS's gaffes in the news he consumes. My guess is that Gary T. consumes a lot of news, and from many different sources and angles. The Washing Times as well as the Post. Fox news as well as MSNBC. Rush as well as All Things Considered. He's in the business of satire and needs to know all sides of the story. I think you're well aware of what's called Group polarization, the tendency these days for folks to listen to, watch and read only those with whom they agree. Narrowcasting and the internet enables people do do this far more than they could 10, 15 years ago. I may be wrong, but I don't think Trudeau lives and works in that kind of echo chamber. Yes, Terrence, I call the echo chamber of which you speak the "journalism of affirmation." We're all guilty of it to some extent. I really doubt Trudeau watches much Fox News or reads the bankrupt Washington Times, but what do I know? Even I don't pay much attention to those outlets and I'm a right-of-center media junkie.It obvious, though, that Obama's gaffes have not been reported by the MSM the way George Bush's were. It's not even close. And for Trudeau to say that Obama has "no salient physical features" and "rarely makes gaffes" is absolutely preposterous. So I don't know what kind of world he lives in, but it's obviously a successful one with a very nice paycheque. TerryI think you're onto something. Why did Obama pick Joe Biden as his " Better gaffe? " Ladies and gentlemen, the role of George W. Bush will be played by Joe Biden in this administration.